Beading Arts: Book review and giveaway: Shrink! Shrank! Shrunk! Book review and giveaway: Shrink! Shrank! Shrunk! You've got to remember Shrinky Dinks, right? Shrink plastic has been around for decades now, but Kathy Sheldon wants you to give it a another look. Kathy's mission is to get you to think about stylish and modern jewelry that can be made from shrink plastic. Ok, I'll bite! Shrink! Shrank! Shrunk! contains over 30 fun projects, all of which would be easy enough for complete beginners, and many of which would be fun to do with kids too. 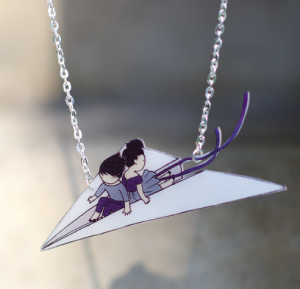 My favorite is a little airplane pendant, shown below. Want to try before you buy? Lark Publishing has made one of the projects (airplane earrings) available at the link above. Would you like to win a copy of Shrink! Shrank! Shrunk! ? Just leave me a comment below and you'll automatically be entered to win. If you tweet or post on Facebook or other social spots about the contest, you can leave a second comment and be entered twice! Please make sure that your link will lead me to an email address, or else I won't be able to contact you. No contact, no win, and I simply have to go on to the next person. 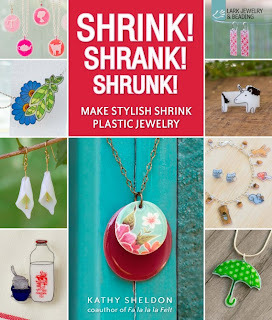 Deadline: November 27, 2012.
how fun ~ for some of us, shrinky dinks never went away! I would love to get this book and learn these techniques. Love Shrink Plastic! There was no shrink art in my childhood but I discovered as an adult and just love it! I am making up for lost time. This books looks like so much fun. Thank you for offering it in a giveaway!!! a friend and I were experimenting with shrink plastic. This would be a great addition to our library. You have the best giveaways. I shared on my "It's All About Creating" Facebook page. I'm hoping to open it for Christmas. Happy Holidays! Looks like a great book. I would love to win it. I've been wanting to try shrink plastic for a while now. Winning this book would remove any excuses. Thanks for the opp! Thank you for creating this giveaway.. I would love to win this book. I just made my first shrinky drink at age 62. What fun! I have 3 little guys that I would love to make something for Christmas. I love to do shrink art - did you know that #6 recycle plastic will work? I'd love to win this book! Shink art is so much fun! I would love a copy of this book. I just love shrink plastic and always looking for a fun way to use it. This might just be it! Thanks for the opportunity to win. This book looks like it has tons of very cute projects that I can make for myself and as gifts =) Oh gosh, what if shrink art becomes another addiction =P I am so excited to receive this book. Thank you so much for your generosity and for your amazing blog. Happy Holidays! Beading Arts for your Kindle! Ever thought about beading your car? Welcome to Book Month on Beading Arts!